So you know how I’ve raved for years about my awesome method for baked hard boiled eggs? Well, today, I take it all back. Okay, not really… But I’m definitely singing a new tune. My new method is even faster/easier/more consistent! You might be wondering why I care so much about hard cooked eggs… But I’m a BIG fan, especially since I’ve been consistently doing a weekly meal prep session. Hard boiled eggs are a super inexpensive source of high quality protein that keeps well for up to a week, making them ideal for meal prep. Conventional eggs run about $0.17 per serving, but even organic eggs can be very economical. I pick up one or two cartons of 2-dozen organic eggs at Costco every week for just $5.99 each — which works out to just $0.25 per serving. Even before I started doing a true meal prep routine, I made a batch of hard cooked eggs near weekly. They’re perfect with breakfast (like these yummy frozen waffle ideas), an excellent addition to lunch and dinner salads, and a fabulous snack before and/or after sports or workouts. There’s a lot of nutrition packed into these little 70-calorie powerhouses! As you’ve probably guessed from the title of this post, I now make my “hard boiled” eggs in my Instant Pot electric pressure cooker! A few days ago I shared my honest Instant Pot review, detailing how I went from being very much on the fence to a raving fan. These Instant Pot hard boiled eggs played a big role in making me a convert. 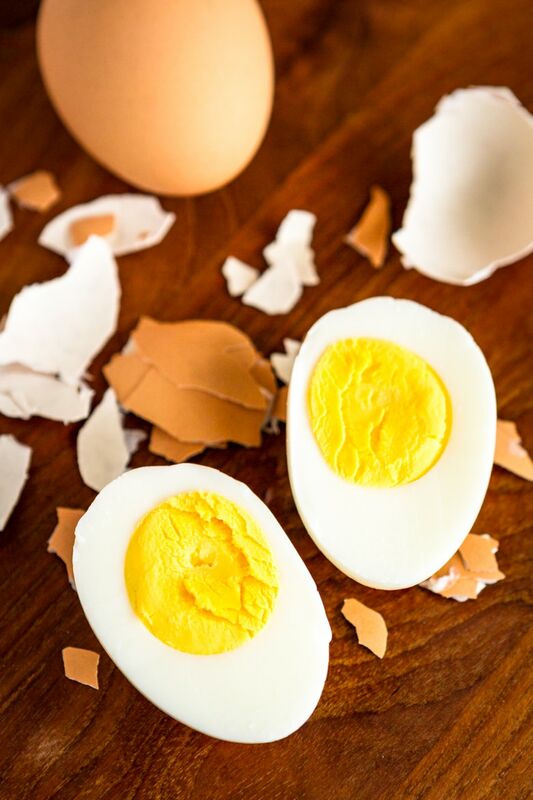 Instant Pot boiled eggs are nearly effortless and foolproof, consistently producing eggs that are perfectly cooked and super easy to peel. All in just 6 minutes of cooking time! Of course, it does take about 9-10 minutes for the Instant Pot to come to pressure — but this is completely hands off time. No watching to see when a pot starts to boil so you can start your timer! If you’re an Instant Pot newbie, these Instant Pot hard boiled eggs are the ideal recipe to follow to become acquainted with your new purchase. I will outline the step-by-step process for you below using only the accessories that come with the IP-DUO60 model. But don’t worry if you own a different model — I’ll also share a few recommended accessories you can pick up that won’t break your budget. Look for those after the recipe! PIN IT NOW! 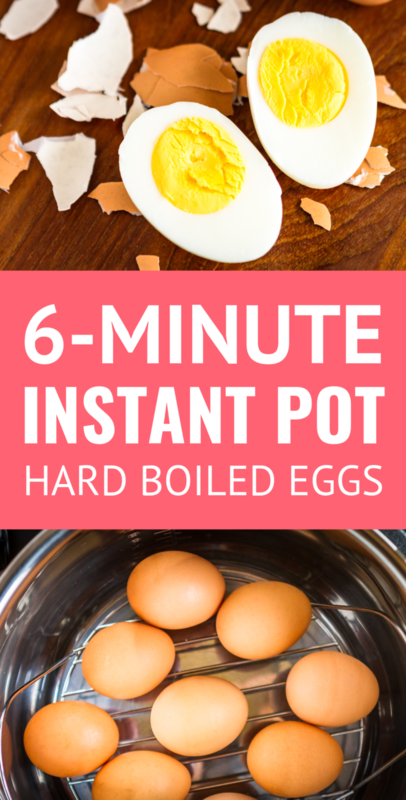 CLICK HERE TO ADD THIS 6-MINUTE INSTANT POT HARD-BOILED EGGS RECIPE TO YOUR INSTANT POT RECIPES BOARD ON PINTEREST! Place the stainless steel insert pot into the Instant Pot base, along with the included steamer insert. Pour in 1 cup of cold water. Arrange the desired number of large eggs, cold from the refrigerator, on top of the steamer insert. Lock the lid on top of the Instant Pot and make sure the steam release knob is turned to “sealing”. Press the Manual (Pressure Cook for the new IP-DUO60) button on the front. High pressure should automatically be selected, but if it’s not for some reason, press the Pressure button to toggle it to high. Use the plus or minus buttons to set the cook time to 6 minutes. Wait a few seconds and you should hear a beep. At this point, the display will read “on”, indicating that the Instant Pot is pressuring up. Once it comes to pressure (about 9-10 minutes), it will switch to the timer to steam the eggs for 6 minutes. When the timer goes off, use a thick towel or a pair of tongs to turn the steam release knob to “venting”. If you’ve never experienced this before, it can be pretty forceful, so pull your hands away quickly, stand back, and allow the steam to escape. Once the pressure is released, press the Keep Warm/Cancel button to turn the Instant Pot off. Then remove the lid and immediately transfer the eggs to an ice water bath (a bowl filled with ice and water) with a pair of silicone-tipped tongs or a slotted spoon. 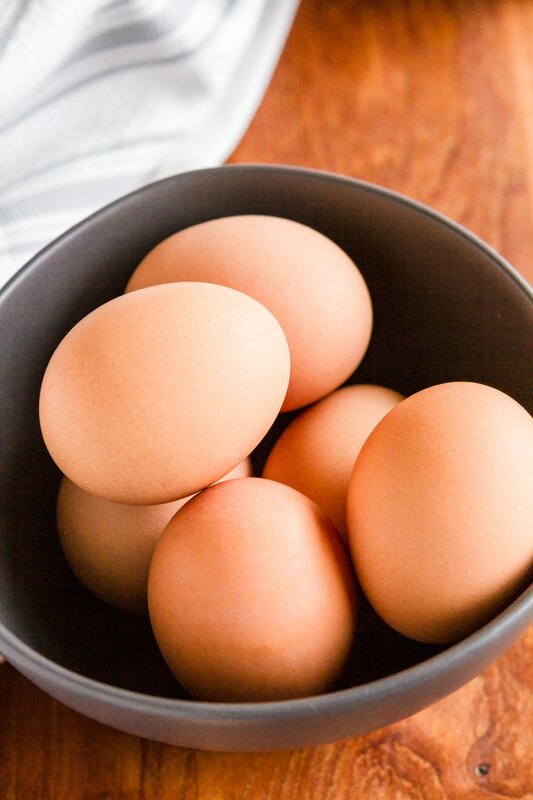 Allow the eggs to cool for 5 minutes before peeling or transferring to the refrigerator for storage. 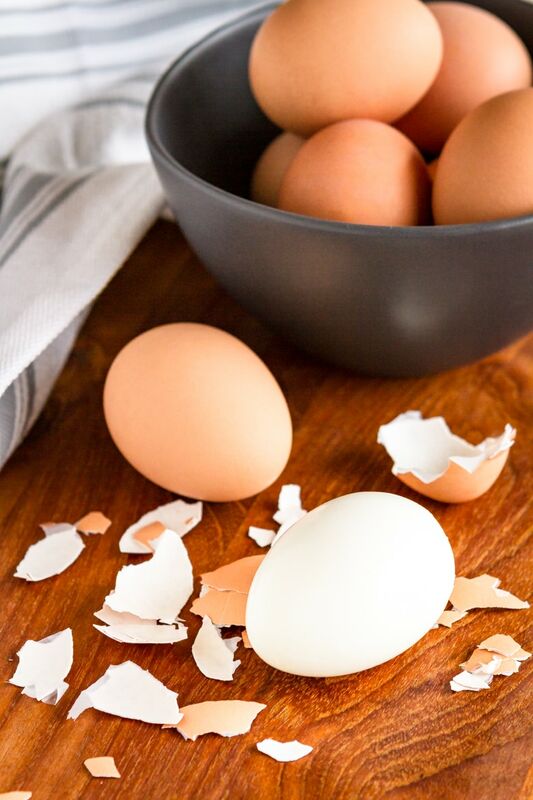 Storage: Unpeeled hard-boiled eggs will keep in the refrigerator for up to one week. Peeled eggs should be eaten the same day they’re peeled. I know that my version of “perfectly cooked” hard boiled eggs doesn’t always align with others’ tastes. For me, 6 minutes of high pressure produces hard cooked eggs with a white that’s completely cooked and a bright yellow yolk that is cooked through but still slightly creamy. While 6-minute eggs are my preference, your ideal perfectly cooked egg may require a longer (or shorter) cooking time, so feel free to experiment. Here’s an excellent resource for comparing the pressure cooking times for eggs. You may not have received an insert trivet if you have an Instant Pot model other than the IP-DUO60. If this is the case, I highly recommend this silicone steamer insert. In fact, I’m going to pick one up even though I have the included insert, simply because I like that I can easily lift the eggs out and submerge them in the ice water bath all at once. Also, if you’re looking for a set of silicone-tipped tongs, you can’t go wrong with these. 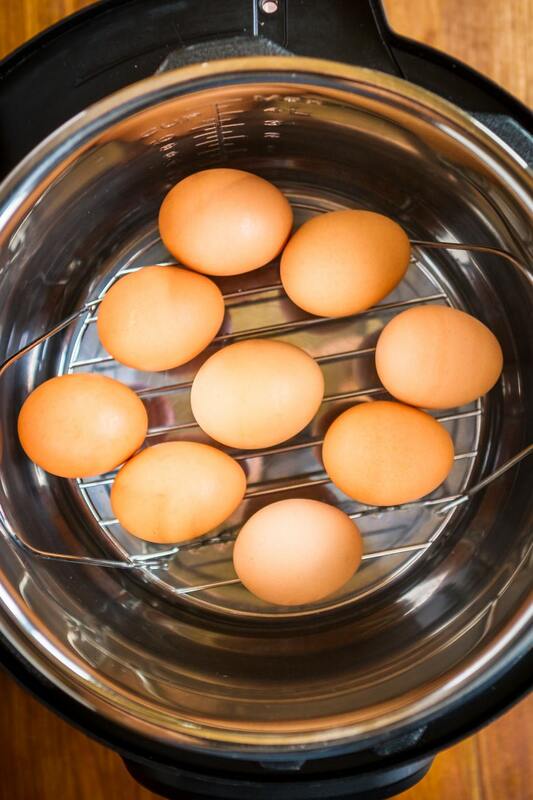 Are you excited to make some hard boiled eggs in your Instant Pot? I can’t wait to hear your thoughts after you try this recipe. If you’re not an Instant Pot owner, I still stand by my old hard boiled eggs in oven method. 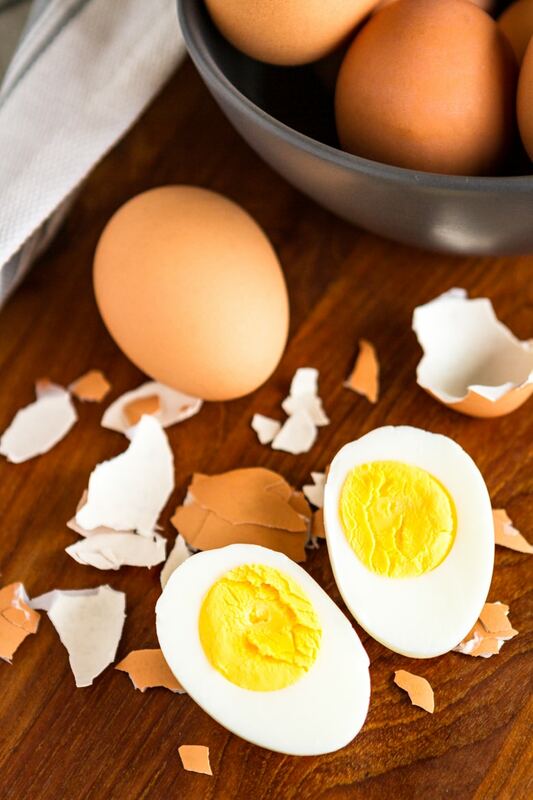 But if you have one (and love hard boiled eggs like we do), this method is life changing! If you love these 6-minute Instant Pot hard-boiled eggs, I think you’ll also adore these perfect Instant Pot sweet potatoes! 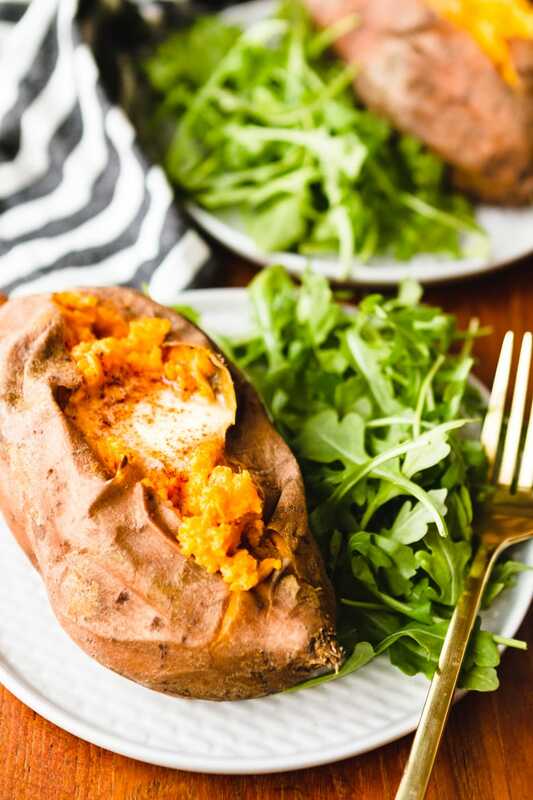 No more undercooked sweet potatoes, this one simple secret will produce perfect Instant Pot sweet potatoes every time… This is a game changer for those doing a Whole30 or meal prep! I’d love to see how your Instant Pot hard boiled eggs turn out… Tag me @Unsophisticook on Instagram or use the hashtag #Unsophisticook so I can check it out. Enjoy! Previous Post: « Make Your Own Easy Bake Oven Refill Mixes for Just $0.12 Each!!! In the final stages, it says to immediately remove and place in an ice bath. Then the directions state to put the pot on warm and let the egg school for five minutes. Do I let the egg school first and then put them in the ice bath? Just verifying. Thanks! Sorry, if that was unclear, Kim! You press the Keep Warm/Cancel button to turn the Instant Pot off, and leave the eggs to cool in the ice water bath for 5 minutes. 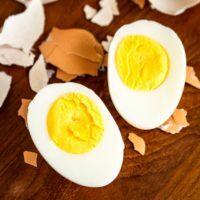 This is definitely the BEST hard boiled egg recipe for the instant pot!! I’ve tried many others only to be disappointed! Thank you for sharing this recipe!! Thanks so much, Sandy. Very happy to hear that it worked well for you!